Epson's WorkForce Pro WF-4630 is a versatile all-in-one office inkjet printer that produces economical color and black-and-white prints. Epson claims that its patented PrecisionCore inkjet technology produces better prints at a better value than a comparable laser printer. Priced at $200 (£130, AU$253), the WF-4630 competes against business-class multifunction inkjet printers like the Canon Maxify MB5320 ($399, £260, AU$505) and the HP OfficeJet Pro X551dw ($300, £200, AU$380). The printer will also compete in the same segment as smaller multifunction color laser printers, like HP's Color LaserJet Pro MFP M277dw ($429, £280, AU$544) and Samsung's Multifunction Printer Xpress C1860FW ($224, £145, AU$285). Weighing 31.3 pounds (14.20kg) and measuring 18.1 inches across by 25.8 inches deep and 15.1 inches tall (46.0 x 65.5 x 38.4cm), the Epson WorkForce Pro WF-4630 isn't huge, but it's large enough that you'd want to place it on a dedicated printer stand or table for use in a shared workgroup. As a personal printer, however, the large, boxy and utilitarian design takes up precious desk real estate, and its presence could feel overwhelming on smaller desks. Like many Epson printers, the WF-4630 has an understated design that works well in business environments, with a matte black plastic body and glossy black trims. Most of your interaction with the WF-5630 will be handled through the 3.5-inch touchscreen panel. Thankfully, the touchscreen is easy to use with intuitive menus. 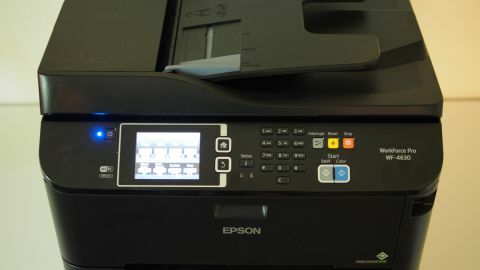 The user control panel at the top also houses hardware buttons for the fax dial pad as well as quick copy buttons for color or black-and-white copies. Compared to the touchscreen-driven interface of the competing HP OfficeJet Pro X series, the presence of physical buttons on the Epson makes the WorkForce Pro WF-4630 instantly feel like an office tool. The WF-4630 doesn't have an SD card slot, but a USB port is conveniently located on the front for direct USB printing or saving scanned files to a flash drive. Additionally, the printer supports printing and scanning using Wi-Fi from a PC, Mac or smartphone running Android or iOS. At the top of the printer is a 35-sheet automatic document feeder, which can be used for duplex scanning and copying, saving you time since you don't have to manually scan each side of a document. This feature can be used for printing, copying and faxing two-sided, multi-page originals. Alternatively, lifting up the automatic document feeder reveals a flatbed scanner for more manual control. The WF-4630 has a single 250-sheet document tray on the bottom, and a rear, top-feed on the back accommodates 80 sheets. If you max out both trays, the printer has a maximum capacity of 330 sheets. In my setup, I have letter-sized paper in the document tray, and I used the rear feed for special one-off print jobs - like for envelopes, labels or for special photo jobs that require more expensive photo paper. Users who need two document trays should look at the WF-4640, a printer that's based on the WF-4630 but comes with two document trays and a rear feeder for a maximum paper capacity of 580 sheets. The WF-4630 document tray can handle various paper sizes, up to a maximum of 8.5 x 14-inch sheets. Using the rear feed, the printer can handle 8.5 x 47.2-inch paper prints. Similar to rival HP's PageWide print technology, Epson's PrecisionCore increases print speed and quality by increasing the density of the print nozzles. The PrecisionCore print chip on the WF-4630 contains about 800 nozzles per chip, which is roughly 600 nozzles per inch. PrecisionCore also decreases the size of each ink dot that's printed, and Epson also widens the printhead. Epson claims that this allows the print head to deliver better control of ink flow, more density of ink dots for better print quality and faster print times.